Compact night vision monoculars NVMT Spartan are designed for nighttime observation and orientation. Devices most prominent feature is the extra powerful built-in IR Illuminator increasing viewing range up to 2-2.5 times. The IR Illuminator enables observation in lowlight conditions and even complete darkness. Use of additional accessories makes the NVMT Spartan especially versatile. For example, with the help of an adapter you can take pictures and shoot video clips. The NVMT Spartan 4?50 features impressive 4-power magnification and great light gathering capacity. This model is great for night photography, game spotting and surveillance. 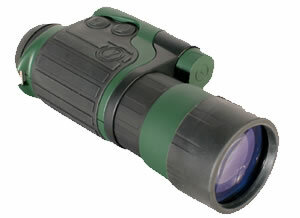 The NVMT Spartan night vision monoculars combine enhanced ergonomics, optimal size/weight ratio and high quality optics. The soft coating ensures reliable grip and protects against environmental effects (moisture, dust etc.). The lens cap can be stored on the backside of the body which prevents it from being lost. Handy layout of operation buttons is another obvious advantage of the NVMT Spartan series.